One of the biggest mistakes writers make is sending out their books before they’re ready. In this month’s video, we cover how to be your own reader, how to find readers and critique partners, and when to hire a professional editor. Whether you just “finished” your first draft or are ten years into a manuscript (like David), these editing tips can work for you. Sending out a terrific manuscript begins with you. You must be your own critical reader. Read your work out loud. This practice reveals so much about your manuscript. When you stumble over a sentence, 99 times out of a 100 there is something wrong with it. You get a different effect when the words go in your eyes, through your brain, and out of your mouth. Once you do everything you can possible do yourself, it’s time to hand your manuscript off to readers. First, your readers should be avid readers of books like yours. Readers in your genre know the marketplace, your comparable titles, and the category in bookstores. Second, you need readers who aren’t related to you. Yes, you want your mom to read your book, but eventually you’ll need someone who isn’t tied to you by DNA or relationships. Find people who don’t know your voice. Here are ways to find readers. Visit Goodreads to find people who read in your genre and maybe you can arrange a manuscript swap. 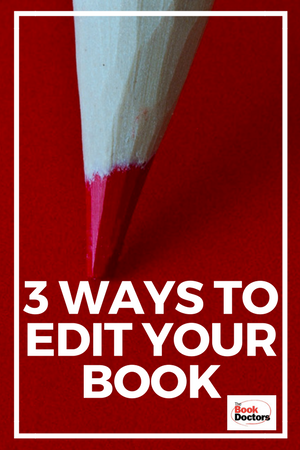 Edit someone else’s book because it teaches you a lot about editing your own book. You want to find someone who has expertise in your area to ensure you’re adhering to tropes and conventions within your genre. We’re book doctors, but we want other editors to read our books, too. David has been working on a novel for ten years–he’s on his 90th draft (yes, 90!) — and he has paid four trained professionals to look at his book. You can find a professional editor no matter how small your budget. If your budget isn’t big, we recommend asking booksellers or librarians who know your genre. There are freelance editors who once worked at publishing houses. But buyer beware! Do your research before you give anyone your money. At the end of the video we share a bit about the live NaNoWriMo Pitchapalooza happening on February 28, 2017. We hope you’ll be able to join us on YouTube at 4PM PST. You can participate live at this link. If you can’t watch live, a recording will be available. Learn more about NaNoWriMo Pitchapalooza here. We’re also offering a free webinar (worth $75) for anyone who buys our book between now and March 15, 2017. You can learn more by watching the video or reading this post.